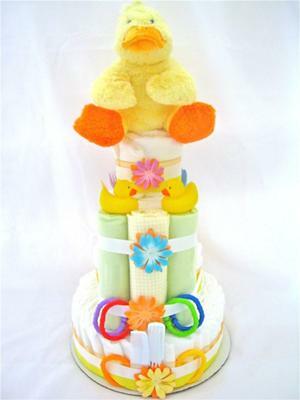 For this Ducky Diaper Cake I used 50 Pampers diapers size 2. Diaper was put together using the over lapped fan method using 2 cake pans. A 9x9 inch round for the first tier and a 13x9 inch for the bottom layer. Held together with coordinating rubber bands. Adorned with matching ribbon and basket hay. It will be wrapped in cellophane and adorned with matching ribbon for the top. I rolled up each diaper (starting with the front) and secured them with a rubber band. I didn't use anything in the middle such as: bottles, blankets, clothes, etc. like many people do. I had my sister hold the diapers in a bundle and I placed a large rubber band around each tier and added the necessary amount inside the large band. On the top tier, I rolled up 2 baby washcloths and put 1 on each side to bring out the blue. To hide the rubber bands, I got 2 types of ribbon that went with the shower theme and taped them with clear tape around the cake. NEVER USE HOT GLUE!!! The diapers tear when taken apart by the mother and it is impossible to get off clothes and wash clothes which could easily scratch the newborn I have learned that through personal experience. Make sure you sit the cake on a piece of cardboard so it is easy to transport. I bought little decorations from a dollar store and placed them all around the cake. I hope you enjoy! This bright and cheery Rubber Ducky Diaper Cake was so much fun to make! The bottom tier is made from diapers - for the middle you can use a bottle of champagne! I love this idea because the whole diaper cake is made using needed supplies and then when they start unwrapping and dissembling the cake, the parents find a festive bottle of champagne to celebrate the arrival of their new little baby! For the middle tier you can roll receiving blankets or baby towels - this is a great alternative to using diapers and gives the diaper cake a taller appearance and a unique look. For the top tier you can use diapers or baby washcloths. Secure each tier with a cute ribbon and add other decorations and necessities such as flowers, baby socks, rattles, bottles, bibs - and of course and adorably plush and squishy bright yellow ducky! This Tub Time Diaper Cake is made with Pampers Swaddlers diapers and is decorated with only quality accessories and ribbon. We use only name brand products the receiving parents will be comfortable using with their new baby. Diapers are not rolled, so the diaper cake is easy to disassemble and start using. This diaper cake also comes in pink. 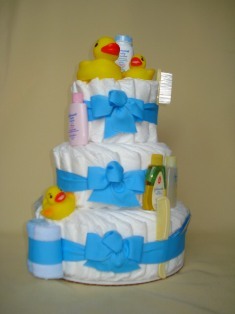 We have a great selection of diaper cakes at www.babeecake.com. This was my first diaper cake so I am anxiously waiting to read any inputs. I rolled all the diapers and secured them with a rubber band. Placed them around the large bottle for the bottom and middle layer and then the small bottle for the top layer. Used the ribbon to hide the rubber bands and placed decoration items around cake. I placed the pond leaves and ducks on the top and finished it of with some white and yellow flowers. It was a big hit and I hope you enjoy the pictures. Please let me know your thoughts. I have already finished my second one and I need your thoughts....do I keep my day job or do I have a little something going on here?? :-) Thanks for your input.